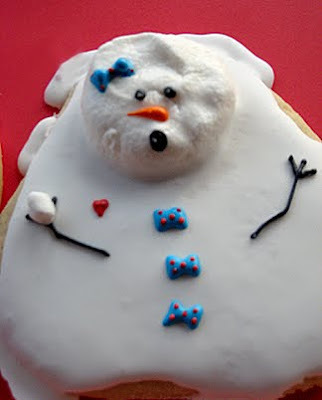 Stacey's Sweet Shop - Truly Custom Cakery, LLC: Marshmallow Melted Snowman Cookie Tutorial. 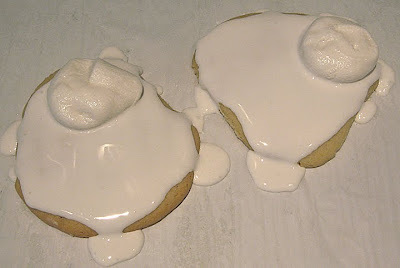 Marshmallow Melted Snowman Cookie Tutorial. Okay… so if we are going to learn how to make a melted snowman cookie, you need cookie dough. You can use just about any Sugar Cookie Cut Out Recipe you choose. But I use one from AllRecipes.com that tastes really good, is soft, and is substantial. I want a “COOKIE”. Not some little tiny thing that is gone in one bite. So… Here’s the link to Michelle’s Soft Sugar Cookies. 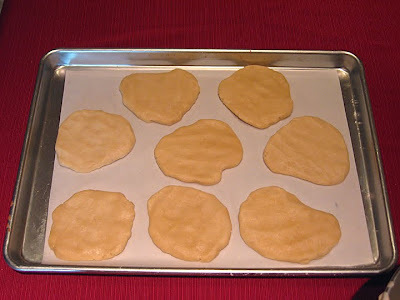 http://allrecipes.com/Recipe/Michelles-Soft-Sugar-Cookies/Detail.aspx Make a batch and get it chilling in the fridge. The recipe says overnight BUT if you get the dough made in the morning, you can be doing a project with your kids after dinner that night. You need the dough to chill thoroughly so think at least 4 hours in the fridge. While your dough is chilling in the fridge, start to assemble the ingredients for the next step. 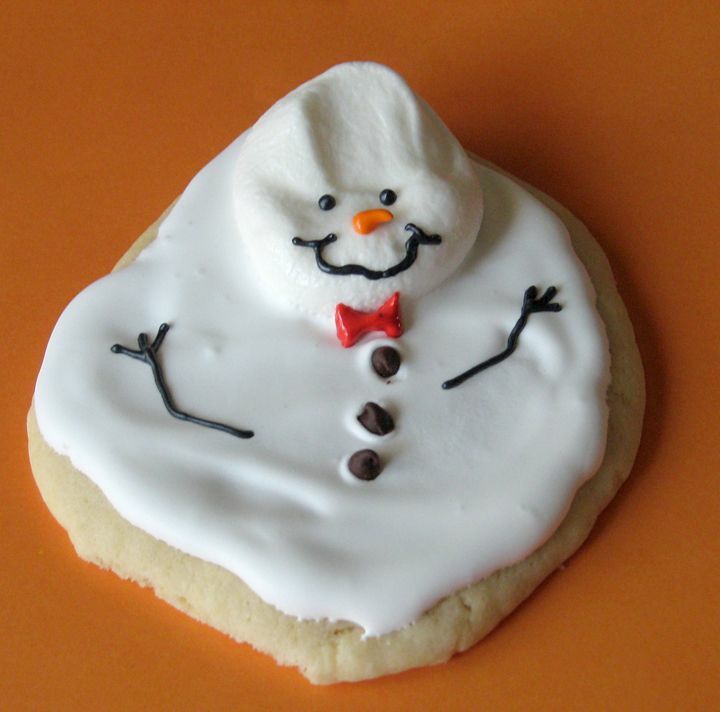 The original concept for a cookie that looks like a snowman melting (Mr. Melty is Meaghan’s name for him) came from Meaghan Mountford of The Decorated Cookie. Her technique is different but if you don’t want to bother with a melted marshmallow and you are familiar with fondant, you might want to try her technique. 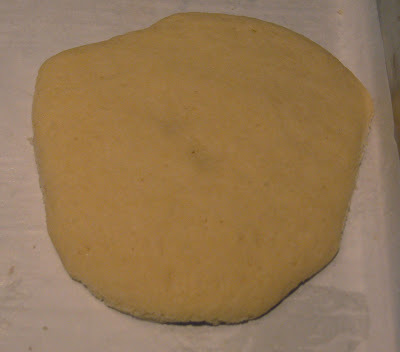 After your dough has chilled for at least 4 hours, prepare your work surface. You’ll need flour, a couple of cookie sheets lined with parchment paper, a spoon or cookie scoop, and a pre-heated oven. 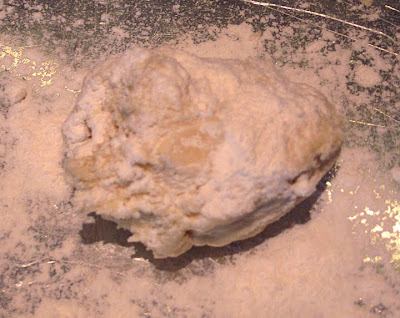 Using a cookie scoop or a tablespoon, scoop a small ice cream scooped size of dough and sprinkle it with flour. This is important if you don’t want the dough sticking to your hands. 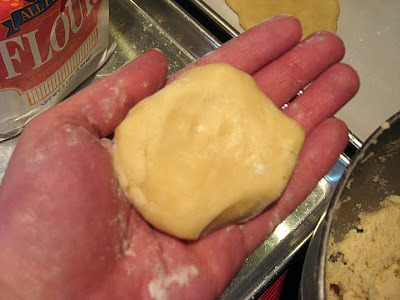 Roll the dough into a ball and start to press it flat. Make it so it has a real wavy kind of funky look to it. The ultimate goal is a puddle. There is no right shape. I like to start it in my hand and then set it on the cookie sheet and press it down until it’s about half an inch thick. Go ahead and repeat that step with each cookie. You’ll want to get them as close to the same size as possible but they don’t have to be exact. Bake according to your recipe directions. While they are baking, go ahead and make your Royal Icing Recipe. I use the Wilton Recipe that has Meringue Powder. If you would like to use this recipe, you can purchase Meringue Powder at a craft store. IF using a counter top mixer, beat all ingredients at low speed for 7 to 10 minutes until icing forms peaks. If you are using a hand held mixer, it will take more like 10-12 minutes. AFTER you get stiff peaks, you’ll want to transfer about 1/2 into a bowl and add a 1/2 a teaspoon of water at a time while stirring until the consistency is slightly runny. To test for the right consistency: Using a knife, scoop a little of your runny icing and hold above the bowl. As it drips, count to 10. By the count of 10, the icing that dripped down should meld into the icing in the bowl so there is no indication of where your drips landed. Put your icing in a container covered with a wet paper towel and a lid. Now that your icing is made and your cookies have cooled, you are ready for the next step. 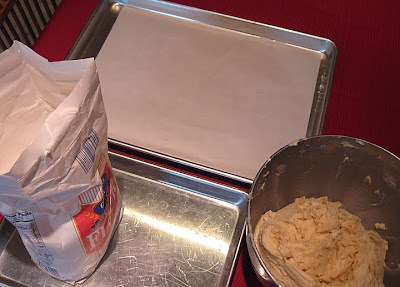 Place a piece of parchment paper on your work surface and pick a couple of cookies to start with. 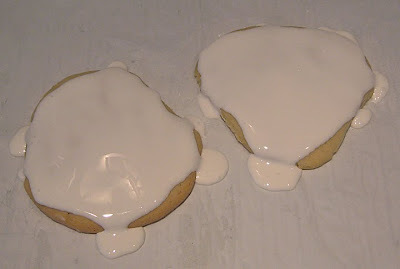 Spoon a small puddle of icing onto your cookie and using the back of a spoon or a knife spread it around making sure to go right to the edges in some spots so he looks drippy. Next, liberally grease a plate or silicone mat with shortening. And place about 8 marshmallows on the mat, spaced out. Set your microwave for 20 seconds and DO NOT WALK AWAY. Watch the marshmallows. As they start to puff up, you are ready to go. Don’t let them get huge or melt. You just want them to puff. Stop your microwave BEFORE they double in size. 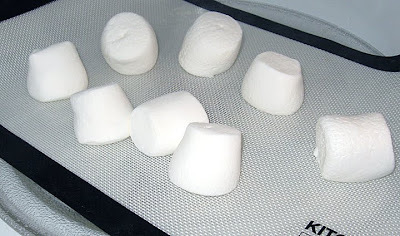 Liberally Grease your fingers and pick up one marshmallow at a time and kind of smoosh it into place. You don’t have to be neat or perfect, just get it on there. The marshmallow should not stick to your fingers as long as you have shortening on them. Repeat this step for each cookie and then let the icing set up just a bit. At this point you’ve got your base ready to go and you can decorate as you please. You’ll need some piping bags and size 1 or 2 tips. You can also use a zip top bag with a very small hole cut in the corner. Color your royal icing the colors of your choice and have fun. If you have never done royal icing cookie decorating, you might want to take a look at this tutorial by SugarBelle before you begin. Cookie Decorating Tutorial. Every decoration on these is royal icing. I pipe the noses on in a medium/stiff consistency. Use a #1 or #2 tip and pull up and away as you pipe. The nose should stand up in the direction you pull. Thanks so much for doing these tutorials! I have so many holiday parties ofr all of the kiddos, I'm going to practice making these and then hopefully be able to pull these off! They are just so cute! This looks delicious! DId you come up with this all by yourself? I am going to use this for Christmas this year! These are soooo cute! Thanks for sharing! I just might have to add these to my list! What a cute idea! I used orange sprinkles I hadn't used at Halloween for my snowmen's carrot noses - worked GREAT and adds a nice 3D feature. I too have to admit that I went the 'semi-homemade' route, by purchasing already baked sugar cookies from Wal-mart's bakery and just decorated...it was less time consuming and less stressful for this Mommy of preschoolers! Thank you for this awesome idea! I made these as a reward for my second grade students using the same recipes for the cookies and icing. They loved them and they were just the cutest things. My two younger boys had a blast decorating the leftover snowmen for themselves, too! I'll definitely be making these again. I've referred a number of people to your wonderful tutorial as a reference! I just tried the link to "the cookie"
and I can't get there. Any suggestions? Adorable! How did you get the carrot nose? Is that icing? Hello, I'm from BRASIL, and I love your work ! I mentioned your name and put a few pictures of your work on my blog ! TOO cute! I love all of your cute christmas sweets, but this one is particularly awesome. I would really like to see the tutorial, but the link seems to be down? I was wondering if you could check this out? Thanks, seems like a really cute idea! 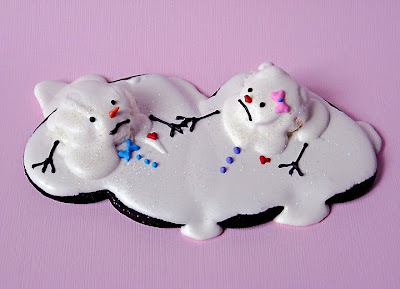 Share your Melted Snowman Coookie Photos! 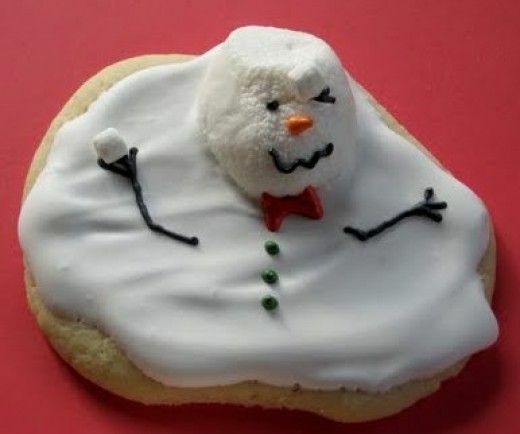 Melted Snowman Sugar Cookies. Just Darling! Cake Wrecks - When professional cakes go horribly wrong. Savvy Work at Home Mom has moved to a new location! Black Friday Sale + Giveaway!